If your company brings in money through invoices, you already know that the delay in getting paid can slow down your cash flow. Your clients owe you plenty of money, but you may not see a dime for several months. That can make planning and budgeting challenging. In commercial sales, it is a routine practice to provide the product or service immediately but get paid for it later. However, many companies cannot afford to wait for payment. If your cash flow is tight because your accounts receivable are on a delay, you can get your money more quickly. Selling your accounts receivable to a third party can put money back in your business immediately. This is called factoring accounts receivable. When you sell your invoices to a factor, that company typically pays you about 70 to 95 percent of the total within 24 hours. The factor works to collect the payment from your customer. Once the invoice is paid in full, you receive the balance, minus the factoring fee. Factoring accounts receivables has become a widely accepted practice that helps companies succeed the working capital they need to grow. Most factoring transactions follow a similar structure. 1. Your organization completes a service or delivers goods to a client. 2. Your organization provides an invoice to that client. 3. Your invoice is sold to the factoring company. 4. You receive the first installment within 24 business hours. On average, the first installment is about 80 percent of the total. 5. The factoring company collects the payment from the client. 6. The factoring company provides you with the remaining 20 percent of the balance, retaining the fee. Let’s say that you own a business that develops and sells fake mustaches online. You have a retail website, but you also wholesale to stores across the country. A major retailer places an order for 1 million mustaches. They want the order within weeks, but you have allowed them 60 days to pay. You need to come up with $50,000 to pay your manufacturer to create the mustaches and ship them to the major retailer. Luckily, the invoice that you issued to the major retailer is for $500,000. You work with a factor, who agrees to pay you $485,000. You’ll end up paying the factor a 3-percent fee of $15,000. You get $412,250, which is 85 percent of the balance, within 24 hours. The factor forwards you the remaining $72,750 when the major retailer pays the invoice in full. This financial advance lets you put money toward not only creating the product that was ordered but also paying your employees and growing your business. You have enough to compensate your sales team for securing more customers and bigger orders. What Types of Companies Factor Account Receivables? Companies of every size in every industry use factoring. Staffing agencies may use factoring account receivable to pay their employees immediately for the work that they have completed even though their clients don’t have to pay the invoices in full right away. Trucking companies use factoring to pay for repairs and fuel costs. Distributors use factoring to pay suppliers while they wait for their clients to pay for their orders. Any company that issues invoices for the work that it completes can benefit from factoring. Is Factoring Account Receivable Just for Startups? When a company is getting started, factoring can be a preferred way of boosting cash flow. If you’re applying for a loan, the bank is going to scrutinize your creditworthiness. This involves evaluating your credit history. If you don’t have at least one to two years of business history, you’re not going to have great luck obtaining a bank loan. Factors look at your customers’ financial soundness instead of your company’s. That means that even if you don’t have a long financial history, you can still get the funds you need to place orders and operate the business before your customers pay. That doesn’t mean that factoring account receivable is just for startups, however. Many Fortune 500 companies use this type of service to maximize their cash flow. Contractors, translators, medical care providers, IT companies, janitorial organizations, printing firms, architects, consultants, engineers and court reporting agencies are among some of the companies that can benefit from factoring. Seasonal companies often use factoring as well. It is difficult to obtain a traditional bank loan when your cash flow fluctuates dramatically from season to season. Banks prefer to loan money to companies with consistent earnings. Factoring companies simply advance you money on invoices on which the money is already promised. Medical care providers often have strict regulations on the way in which their invoices are handled. Many factors offer services specifically to that niche. Trucking is another specific category to which specialized factoring companies cater. The world of online business is growing rapidly. Some financing companies work directly with digital companies. Lendvo has filled that niche with financing options that are tailored specifically to domain name buyers and sellers, eBay and Amazon sellers and website owners. Entrepreneurs and organizations in online business face specific challenges that don’t affect other industries. The Lendvo team understands those obstacles and can help those in the industry find creative solutions to help them succeed. • Has customers with good commercial credit. • Allows customers to pay on 30 to 60-day terms. • Has realistic profit margins. • Issues invoices with larger balances. • Needs funds immediately to pay for continual operating expenses. • Does not have major tax or legal issues. Organizations seek financing when they are trying to solve a specific problem. Perhaps you are an online retailer who just rolled out a new product. Clients have placed large orders for your item, but you can’t pay your suppliers to manufacture it until you have been paid. You can sell your invoices to a factoring company to get the funds that you need to create your product. You don’t need to factor all of your invoices. Depending on your particular business needs, you can factor only the invoices that have longer terms. Answering the following questions can help you determine if factoring is right for your business. 1. How long does it take for your customers to pay their invoices? It is customary for customers to have a window of time in which to pay for commercial products and services. If your customers usually pay on time and your invoice terms are 60 days or fewer, factoring may be an option for your organization. 2. Do you have cash flow problems that result from delayed payments? In order to follow industry standards, many companies offer terms even when they can’t afford to do so. If you can’t pay your employees or suppliers because you have offered your customers delayed payment options, factoring can help you secure cash more quickly. 3. Do you have credit-worthy customers? If your customers have a long history of good commercial credit, factors will view them as more reliable. Because your invoices will serve as collateral, the factor must determine that the risk of nonpayment is extremely low. 4. Does your company have any legal or tax problems? If your company has had legal issues or trouble paying taxes in the past, a factor may not want to work with you. Why Not Just Get a Bank Loan? A traditional bank loan delivers a set amount of money. If you’re factoring your invoices, you can increase the amount of money that you finance as you issue more invoices. That means that you can scale your cash flow as your business grows. Obtaining funds through factoring is faster than obtaining a traditional bank loan or line of credit. Applying for a loan through a bank can take a month or two. You are required to submit financial statements, paperwork and documentation throughout the process. With a factoring company, you can set up your account in less than a week. At Lendvo, we can process your application and deliver your funds in fewer than seven business days. Banks may dictate how you use the loan. If you claimed that you needed the money to develop a new product, you can’t use the funds to pay old bills. Factoring accounts receivables allows you to use the money for any purpose. The factoring company is not banking on your company’s growth in order to pay off your balance, because you have already completed the service for which the client is paying. If you don’t use the funds wisely and your company’s growth slows down, you simply won’t work with the factoring company any longer. • Help you obtain working capital quickly. • Allow you to expand your business before your clients have paid. • Provide more money than a traditional bank loan. • Allow you to secure cash when you can’t get a traditional business loan. • Save you the hassle of dealing with collection issues. • There are typically higher fees for longer terms or industries with higher risk. • You may be required to put up collateral if your clients don’t pay. • If your clients don’t pay, factoring companies may increase your rates in the future. 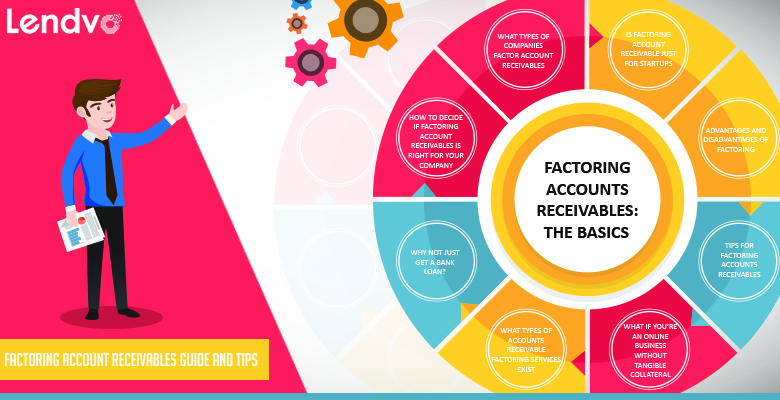 What Types of Accounts Receivable Factoring Services Exist? Many specialized factoring account receivable companies tailor their services to particular industries. Others work specifically with startups. Some are available to finance any company that meets its criteria. Lendvo provides financing services for digital businesses. Most factoring companies require you to have at least $5,000 in collateral. In addition, factoring companies prefer invoices with shorter terms. This reduces the risk of dealing with collections. Some companies charge higher fees for dealing with invoices with longer terms, invoices with lower balances or smaller or newer companies. However, most organizations can find an accounts receivable factoring company that will work with them. If you’re thinking about using invoice factoring to secure cash flow for your business, consider the following tips. Don’t sign a long-term contract. If the relationship with the factoring company isn’t right for your company, you need to be able to sever ties and use another factoring service. In addition, you need to be able to have an exit solution if your company doesn’t grow as projected. This is especially important for startup companies. Be cautious of low introductory rates, and make sure that you are aware of any hidden fees. Find out if there are minimums to maintain or inactivity fees. Save your contract and any appendices somewhere safe. You’ll want to review the agreement if there are any disputes or if you want to terminate the agreement. The term of your contract may be changed with every addendum. Ensure that you have access to online reporting. This will allow you to look for and deal with any discrepancies in a timely manner. If you are responsible for collections, monitor them closely. If your clients pay more quickly, you should be able to pay lower fees. What if You’re an Online Business Without Tangible Collateral? Factoring is a great option for companies that rely on invoices to collect payments from customers. If you’re experiencing dramatic growth and need to pay employees, vendors and operational expenses, factoring can supply you with fast cash without putting you in debt. If your company has similar criteria but doesn’t issue invoices, how can you obtain working capital? If you have digital assets, Lendvo can help you get money to start or expand your business. You won’t have to deal with a traditional bank that doesn’t understand your industry, and you won’t be locked into a long-term loan. Lendvo is an alternative lender that helps qualified borrowers to secure financing. Although Lendvo works with all types of small businesses, the company specializes in working with digital organizations. Internet businesses have different assets than traditional businesses. The experts at Lendvo are experienced with evaluating traffic and sales analytics, intellectual property values and website growth. Lendvo uses a proprietary process to analyze a borrower’s digital assets in a way that traditional factors or other lenders can’t. Domain names are legally considered to be property. This property is a digital asset that can be considered as collateral to pay back a loan. However, most traditional banks will not approve a loan to a domain name buyer. E-commerce companies may not use invoices, but they may need funds to fill in the gaps between their supply and demand. Other internet companies may simply need to increase their working capital to expand their services or increase their marketing efforts. In many ways, a domain name is like an invoice. If you’re selling a domain name and have entered into an agreement with a buyer, Lendvo can advance you the full amount and take over the process of collecting payments from the buyer. However, Lendvo’s opportunities don’t stop there. If you’re the buyer, you can convert your payment plan into a loan. This can help you spread payments out over a longer time span. Domain names are important. Working with Lendvo can prevent you from needing investors to fund your domain name purchase or future company projects. This means that you own 100 percent of your business and don’t have to report to anyone. For many internet businesses, this alone is enough reason to turn to an alternative lender. Lendvo is not a bank. Therefore, it can fund businesses using alternative and progressive methods that aren’t available from a traditional financial institution. In addition, Lendvo structures most of its financing around cash flow and working capital issues. Lendvo’s process is different than the approval process conducted by a bank or a factoring company. Lendvo takes your own credit history into account, but the company also looks at your digital assets. Lendvo’s loans are not the long-term deals that are usually available for domain name buyers and internet businesses. Lendvo can provide you with working capital over a short period of time. Lendvo loans can be customized based on your company’s needs. Interest rates for Lendvo working capital loans start at 1.5 percent per month. The company can provide up to $100,000 in financing solutions. Lendvo provides capital much more quickly than traditional banks do. You could have your financing within a week. If you have a digital company that needs working capital and a traditional bank loan is not appropriate, you might have considered factoring. Chances are typical factoring services don’t quite understand what to do with your digital assets. Lendvo can provide you with the working capital that’s crucial to your business growth while evaluating your assets fairly and competitively.